Do you have a financial blog or a blog about debt, money management, or household spending? 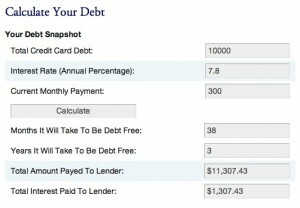 Add a free debt calculator to your blog with no coding required. The form’s container DIV will have class “sampleCssClass” and will be 100% wide. The table will NOT be zebrastriped, and the legend text will be “Your Debt Snapshot”. As you can see, it’s functional, easy to use, and the numbers may be scary! Drop a line if you have any feature requests or recommendations. when I changed the currency to £ my page just displays with a sqaure where the pound symbol should be after you enter details…. Thanks tried that but doesnt work I just get &pound;500 for example. To make it clear this is what I did. I have problem while downloading the plugin. The zip file is 0kb and I can’t extract the zip file, it shows an error massage. How can I add the Indian Rs symbol? @Infoman – Replace currency: "$" with currency: "u20A8"
Entered code into a widget. The one I had in there previously is not working now either.